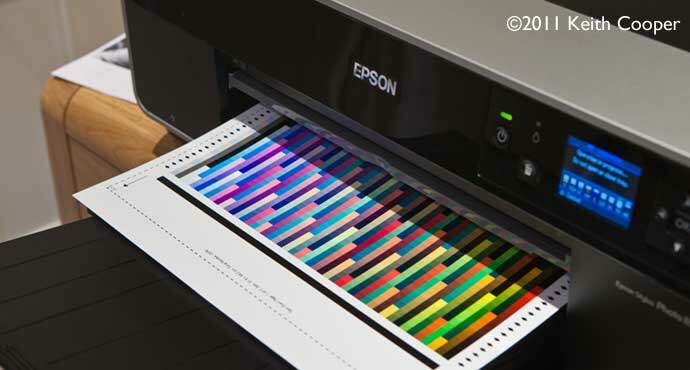 The Epson R3000 offers a number of changes and updates over the previous A3+ printer, the R2880. Larger (25.9ml) ink cartridges and no need to swap black inks are the obvious changes, but there are many other refinements. 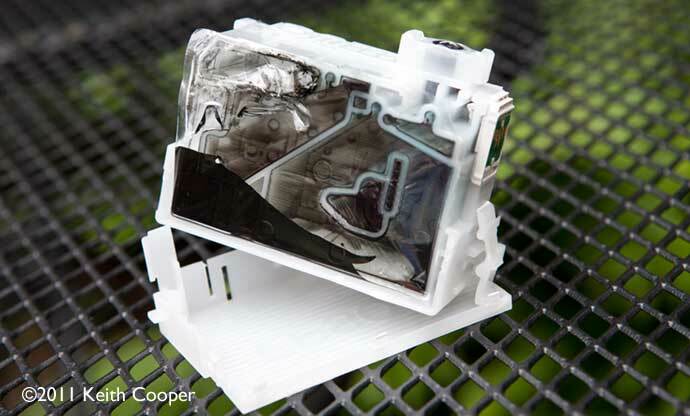 Keith Cooper has been looking at how it performs as a photographic printer. 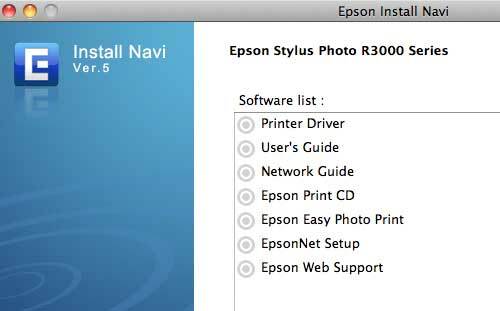 Most of this review looks at an Epson R3000 driven directly from Photoshop and using an Apple Mac. Functionality is very similar if you were using a Windows PC. 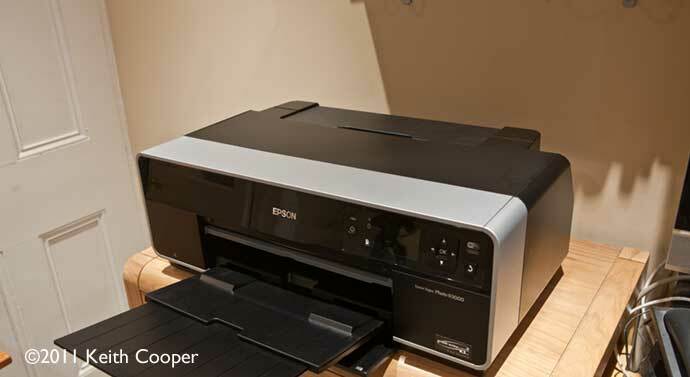 Keith has written numerous other printer related articles and reviews, including the Epson R2000. This review concentrates on using the printer for high quality print output, rather than covering the bundled software in any depth. What do you get with the R3000? 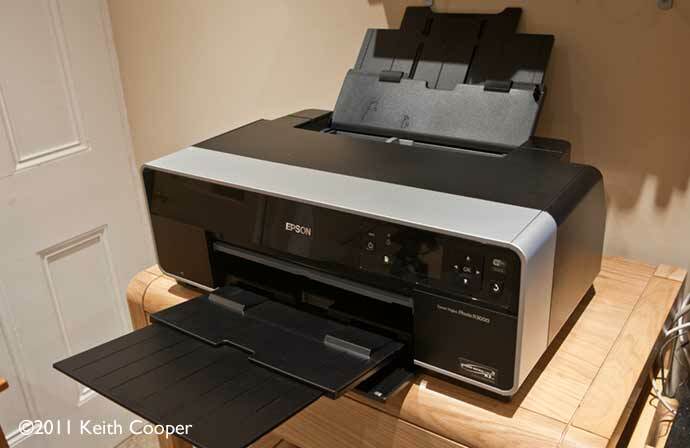 The R3000 is a solidly built printer – it immediately feels more substantial than the old R2880. All the controls are now on the front panel. The R3000 is not a replacement for the R2880, which will continue to be available. 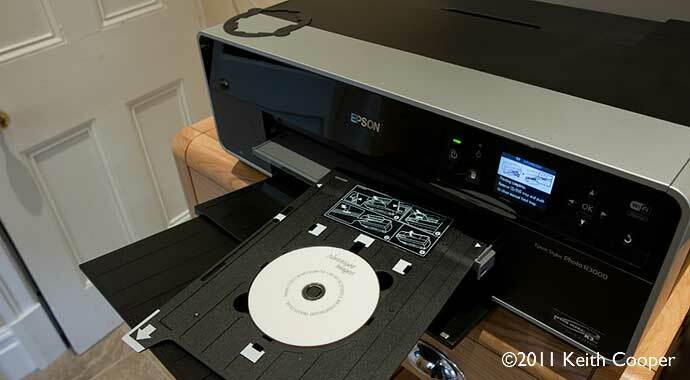 Our printer was kindly lent by Epson UK for this review. It was supplied with inks already installed. The first time ink charging process takes about 10 minutes. After previous experiences with printers and delivery services, I left the printer overnight to settle after taking it out of the box. I also ran some nozzle checks and cleaning cycles, since these printers are not designed to be shipped with ink in them. Very quickly I had clean prints with no blocked nozzles. The picture below shows some of what’s in the box. Notice the larger 25.9ml ink cartridges compared to the smaller 11.4ml ones of the previous R2880. Also shown, the roll paper holders, USB lead and CD/DVD printing holder. At ~15kg, the printer is not difficult to lift, but you should take care removing it from the box. Not shown in the view to the right is the opening for stiff media, which can stick out of the back quite some distance. You need to allow suitable working space. 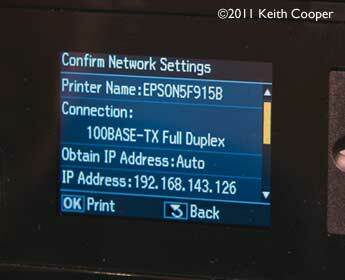 The printer doesn’t lack for connectivity. The photo above shows a 100MB Ethernet cable coming from our network cupboard. There’s a 1000Base-T socket nearby, but that went to a laptop, connected to the printer via USB. The wired connection found our DHCP server immediately (your router/hub may perform this function) and, as you can see below, acquired its own network IP address. The LCD screen is very easy to read and offers simple navigation. 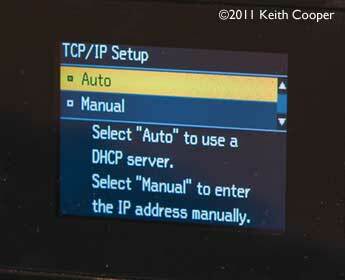 If you are not familiar with networking, I’d suggest reading some of the supplied guides or configuration software. The wireless option also worked well, once I’d entered the appropriate settings. The testing here though, was with the printer on our Ethernet network. The printer appeared on the network straight away. 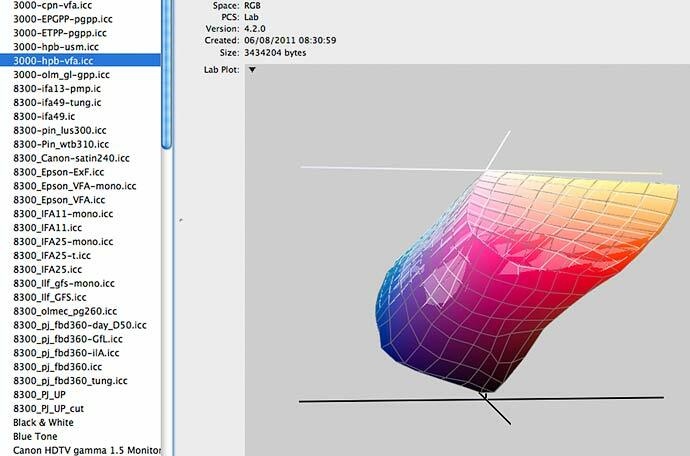 The screen shot below is from an Apple Mac in another office. 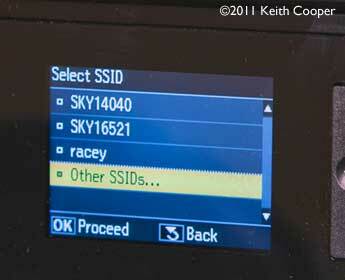 The shared option is via a laptop and USB connection – there are a lot of ways of talking to this printer. 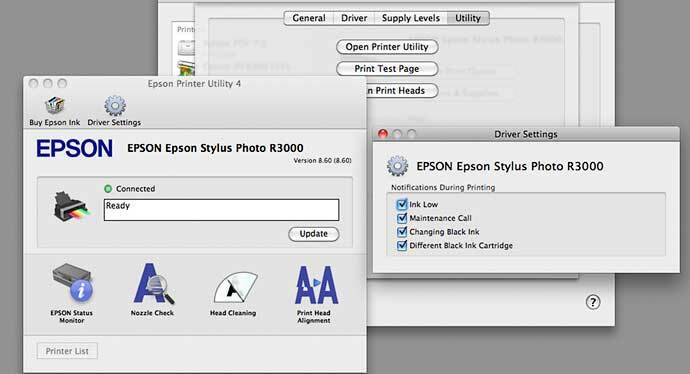 Note – QuadToneRIP is 3rd party black and white printer software – it currently only offers initial partial support for the R3000, although this should quickly improve with more paper profiles to work with. I’ll cover more about B&W printing later in the review. I installed software from the supplied disk on to an Apple Mac running OSX 10.6.8. The software options are broadly similar if you are installing on a Windows PC. The user’s guide is well written and explains most options well. I would note though that if you intend to use roll paper, do check through the settings carefully, since it’s easy to miss a step and truncate prints or waste paper at the end. 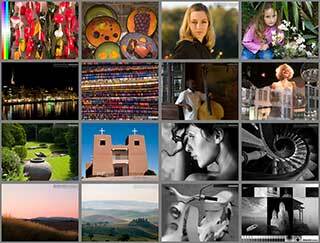 All of my photo printing here is via Photoshop, although I did print out a few PDFs and some MS Word documents. Whilst I’d not get a printer like this for general office use, it worked just fine with a stack of A4 copier paper in the top loading slot. I should note that it’s a very quiet printer compared to earlier models – the lack of loud whirring sounds on startup being a welcome change from some printers. Not having to move a set of cartridges back and forth with the print head means that there is much less mechanical stress on the head and drive system. The printer goes into a sleep mode when unused for a while. 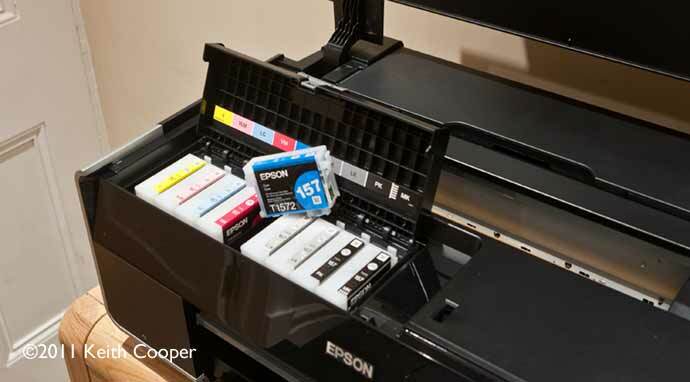 The ink carts are situated at the left front of the printer. Unlike the R2880, they are stationary. There is an ink cart for each colour ink – 9 in all. There are several warning when ink is running low. Just to see what happens, I ignored all the warnings, until ink ran out during a print. When light cyan ran out on the print below, I could see no mark at all. There seems to be much less ‘ink charging’ activity after replacement than with theR2880 – printing restarted almost immediately. Out of curiosity I opened up an empty cart – there is very little ink left in the cart. 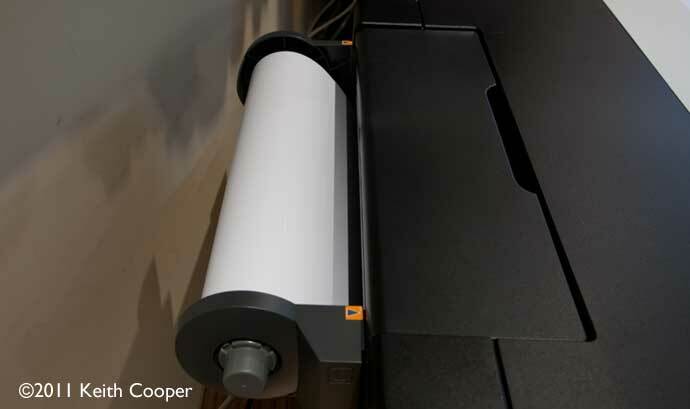 If you have experience with one of the earlier A3+ printers then you’ll know that you have to use different black inks for matte and glossy/lustre papers. 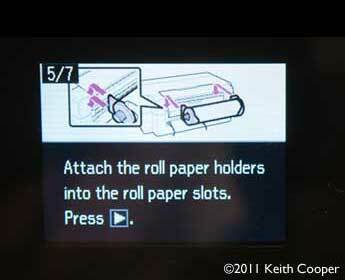 This was one of the reasons I used to have two Epson large format printers (SP7880 and SP9600). 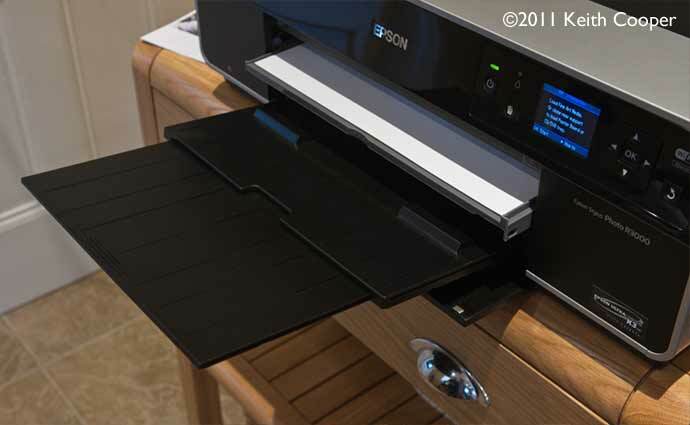 The Epson SP3800 introduced automated switching, where the amount of black ink lost is much reduced. This feature is found in the R3000. In the R3000, you can instigate this switch from the front panel if need be. 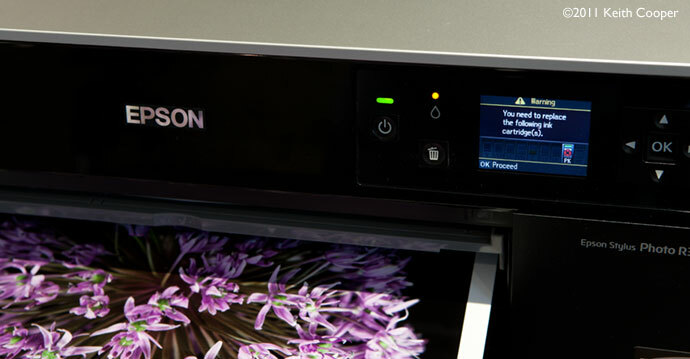 Or, you can use the Epson printer utility from the computer you are using. You can make the switching fully automatic, but I find the manual approach makes me think more about grouping similar prints together to save on ink changes. These figures are from Epson. Since the switch does use some ink, it’s not something you want to be doing every day (not if you are paying for black ink). The paper loading has been updated from the R2880, with normal photo papers and plain paper loaded in the top slot. 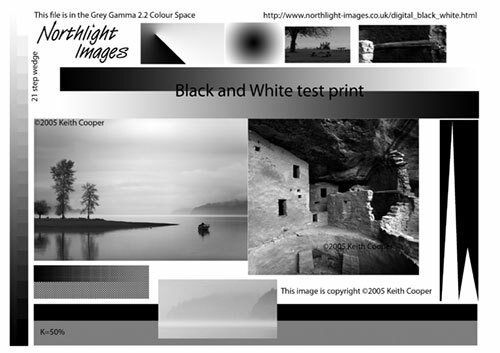 In the image below, the grey loading tray has been extended and a sheet of paper placed in the printer. The tray needs to be pushed back in after loading – as with most options, the display can show full details of the process. Move you mouse over the image to see the sheet after it’s loaded. Note that the paper does not come out of the main loading tray, but a small secondary tray that pops out at the back of the printer. 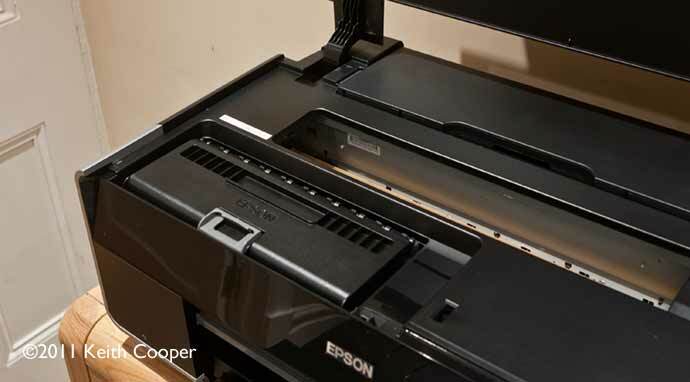 This secondary tray is also where roll paper goes into the printer. The R3000 has optional roll paper supports at the back. 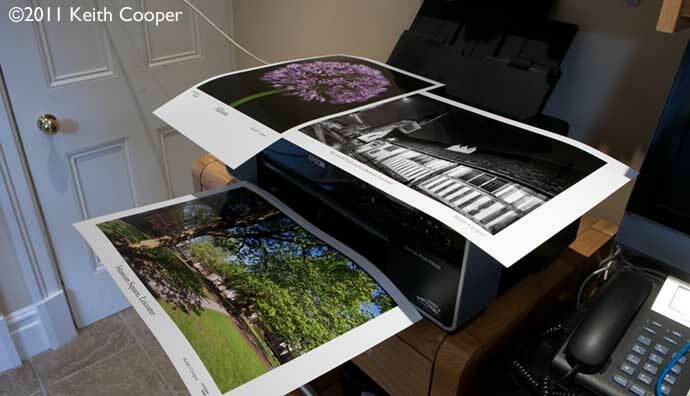 The specifications say that prints up to 44″ long are supported. I’m testing with a roll of 13″ width paper I had left over from an earlier test. 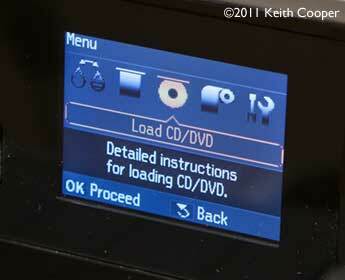 The main display offers clear instructions for the loading process. The paper is now loaded and ready for printing. One of the first prints I made was to create an ICC printer profile for the paper. 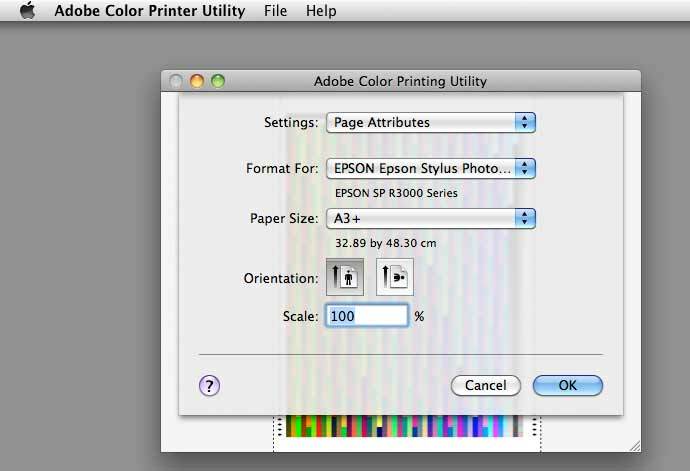 I’m printing using the Adobe Color Printing Utility – a small (free) application that just prints colour profiling targets with no colour management, on Apple Macs. Note how I’ve selected the roll paper paper size option. 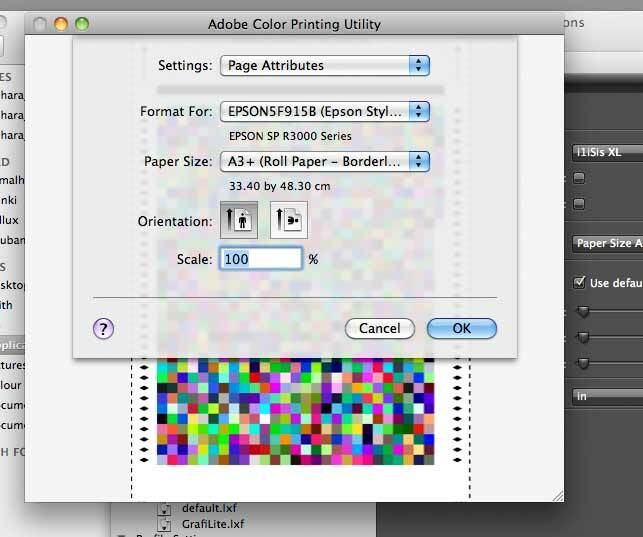 In this case, ‘borderless’ prints the target to the full width of the paper. For a normal print, I don’t want it expanding and have also set the ‘save roll paper’ option, so that printing is limited to the length of the image. As I mentioned earlier, do read all the instructions for roll printing and if you are new to it, I’d suggest experimenting with some cheaper paper to start with. Since the R3000 has no paper cutter, you can get the printer to print a (very) thin dotted cutting line and advance the paper once printed. 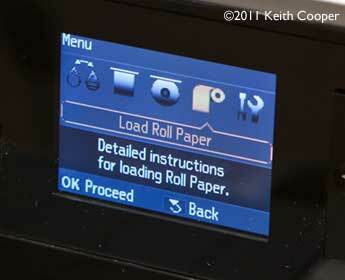 After you cut the paper and press the OK button, the printer will rewind the paper, ready for the next print. Notice the problem with using roll paper? The curl is exacerbated with paper from a 2″ core, where the curvature on the roll is more pronounced. If roll paper is the reason you are looking at the R3000, then do think seriously about just how you intend to use it. Even with our big 44″ width printer I often print on cut sheets. I’m assuming that most people wanting a printer like this want to make prints to look at, and that these prints are likely to be viewed at a reasonable distance. Why do I say this? Well, modern printers with good paper and well made profiles are capable of producing stunning prints. Indeed, unless I’m putting prints next to each other under controlled viewing lighting, very few people could tell the difference between most images printed on different (good) printers on the same paper. That doesn’t mean there aren’t differences, it’s just that the images that clearly show them are getting more difficult to find. The cold pressed paper has a more obvious surface texture and lacks the optical brighteners found in the smoother hot press paper. 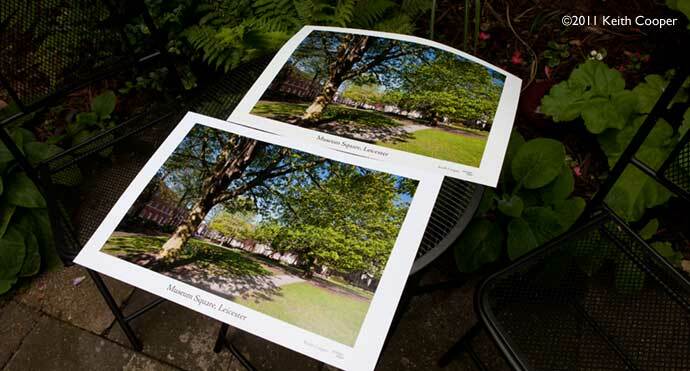 The same image printed on both papers, photographed outside in the shade. The brighter white paper also shows a slight surface sheen (see next photo as well). 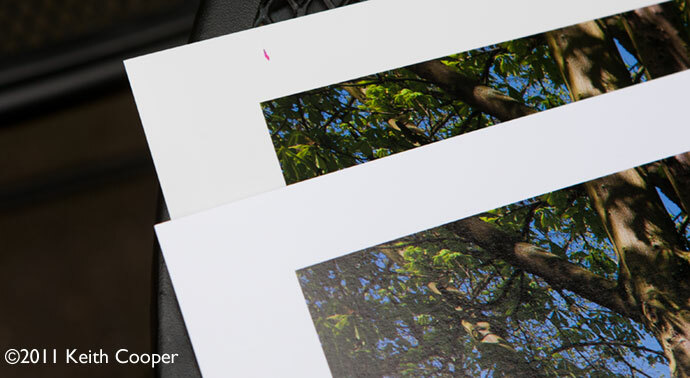 Both papers worked very well in the R3000, giving good bright colours and good depth for black and white prints. You might wonder which paper I’d choose for printing my own photos – so did I… I’ll be writing up more about paper choices in a future article, where I found out more about how image content and mood influences and is influenced by paper choices. If you’ve been making prints with a lot of ink on them (Gloss papers take a lot of ink) and then want to run a thicker paper through the printer, then I’d suggest a quick nozzle check on plain paper, since I had a couple of instances of ink smudges like the magenta mark below. The two sheets are both cotton rag papers – not cheap, and just one mark like this ruins a print for me. Before any printing I always ran a nozzle check and I should note that there was not one blocked nozzle all the time we had the printer, once I’d rested the printer after its journey here. It’s a paper with vibrant colours and very deep blacks – I looked at an early sample several years ago (TPP review) and wondered if it had changed at all? Unfortunately initial prints showed what are called ‘pizza wheel’ marks from the paper guide rollers. It’s not normally as obvious as the photo below – I had to get the lighting just-so for it to show up, but it’s still there as an unacceptable mark (Archival matte paper also showed it, but not Premium Glossy or even Velvet Fine Art). I suspect that I’m seeing a problem brought about by this being a review machine that’s been bumped about in transit once too often. 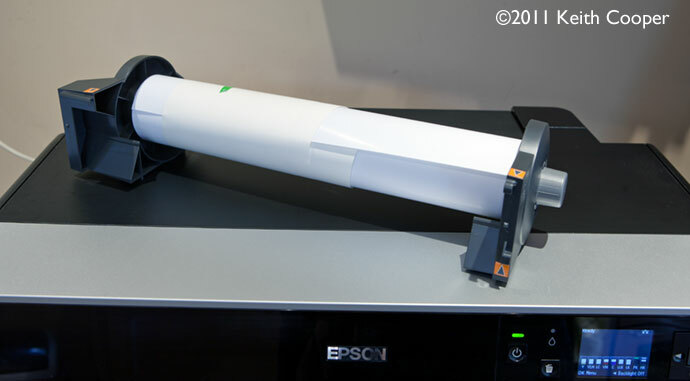 Update – Epson UK tell me that when checked on its return, the printer had indeed been damaged in transit at some point. I mention it here, since I’ve not heard of it elsewhere, and if your printer is damaged, it might just explain why your prints have marks and scratches. Many years of printer tweaking allowed me to move the offending part and subsequent prints were just fine. The lustre finish of the Traditional Photo Paper along with it’s deep blacks and moderate optical brightening (bright white) give some images extra punch. Despite the mark on the photo above, I think the paper has given a real depth to the image (printed using the Epson driver’s ABW black and white print mode. It is however, a paper to take care with. Update Dec 2012 – the print scratching problem is addressed by a contributor to the DPR forums. I like to make our own colour profiles for papers and printers I’m testing, using i1Profiler from X-rite and an i1iSisscanning spectrophotometer. You can see in the background, the ~2200 patch test target I use with a sheet of A3 paper. When profiling, it’s important to get the optimum media settings for your paper. 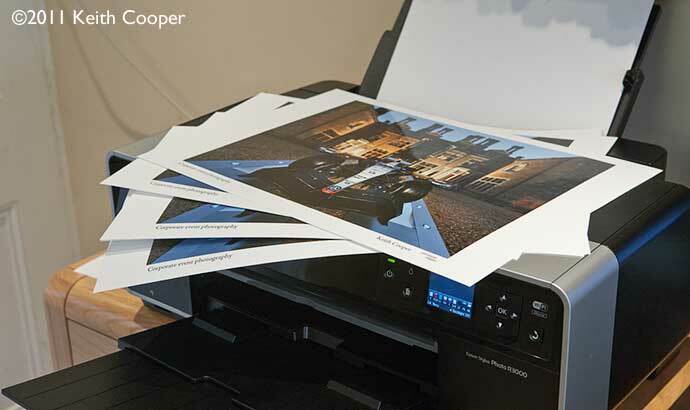 With Epson Velvet Fine art, the setting is here, but what about the two pressed papers? 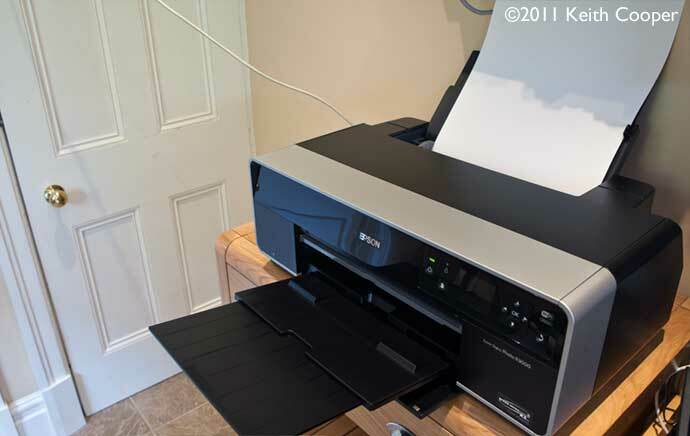 For Stylus Pro printers the Ultrasmooth (USFAP) setting is suggested, but for Stylus Photo R printers (such as this R3000) the Velvet (VFA) setting is suggested in the leaflet that comes with the paper. Personally I’d prefer it if there were options to define your own custom media settings, but perhaps that’s a bit much to expect on a smaller printer like this. Out of curiosity I printed a test sheet with each setting. The top sheet is with VFA – notice the generally smoother gradations in the coloured patches. I made a profile for each setting and compared them. I’m not normally a fan of comparing gamut plots, but if you roll your mouse over the image below, you can see the difference between profiles made for the USFAP and VFA settings. But seriously, if you are doing your own profiling then optimal media settings really do make a difference. 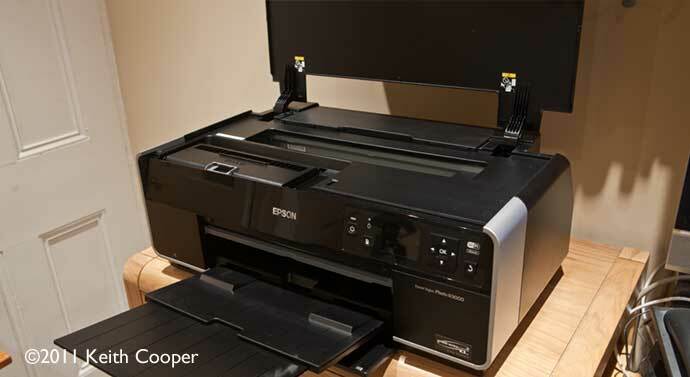 You just choose it in the driver and you can print great neutral black and white prints with no further adjustment. The driver will convert colour images to greyscale, but I really wouldn’t want to leave my colour to B/W conversion to the printer driver. 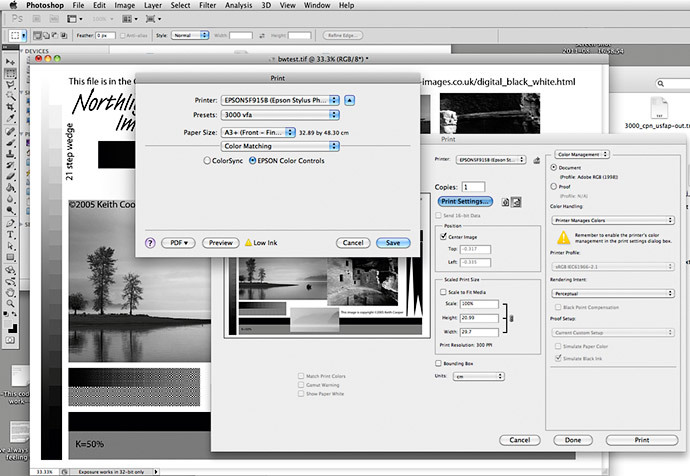 There are numerous tinting and tone balance options available, but I prefer to use the default settings. 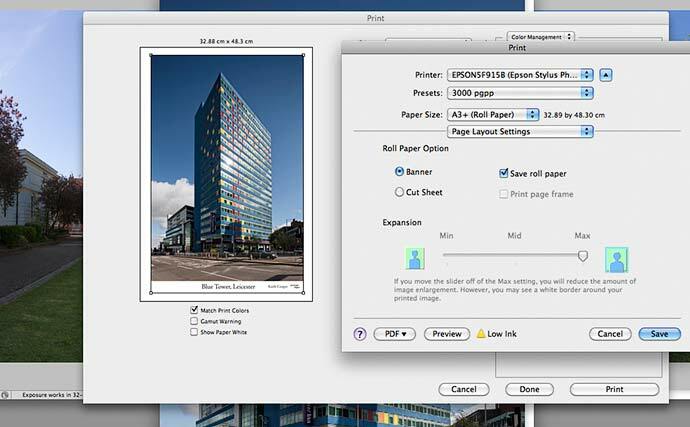 You can use software such as QuadToneRIP (QTR) for B/W printing (only $50 shareware – excellent value), particularly if you want to use third party papers and have finer control over ink balance and tonality. That said – for this printer I’d probably use ABW (I like neutral prints and personally find that toning is all too often used to try and make an OK image into something it isn’t). One other use of QTR is for linearising greyscale output, through the creating of greyscale ‘profiles’. I’ve an article from a while ago about this process if you’re curious. 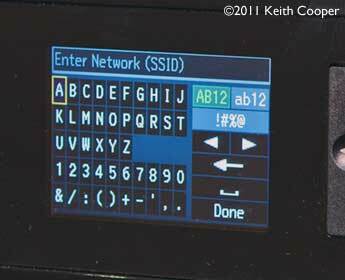 – if all this sounds complex, then just go ahead and print with ABW, it works fine. The graph below shows different measurements for the two media settings for Cold Pressed Natural I mentioned earlier. It’s included for our more techy readership, so don’t read too much into the numbers! Move your mouse over the image to see the figures for the VFA media setting. The upshot of all this, is that I’m happy to use the ABW mode as-is on the papers I tested. Extra software that used to come with printers was often rather basic and easily ignored if you were looking at photo printing. I’m pleased to see two applications with this printer that I’d actually have a use for. 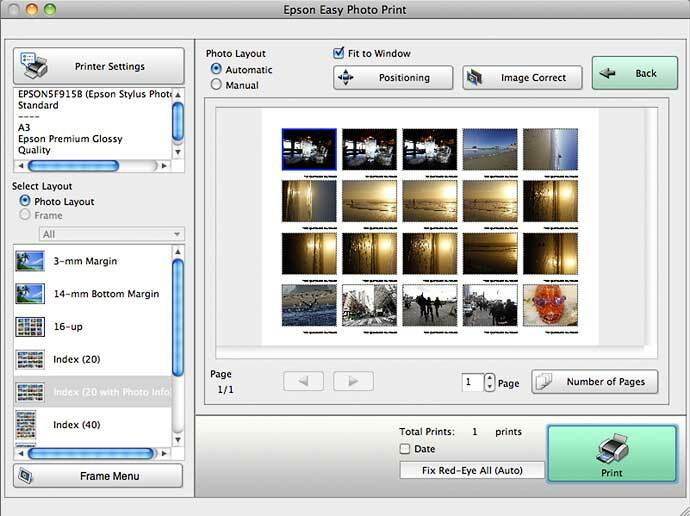 First is Easy Photo Print – which won’t win any prizes as a photo editor, but is great for index prints and holiday snaps. I know that I’d still use software like Photoshop (or Aperture or Lightroom) but this worked fine. 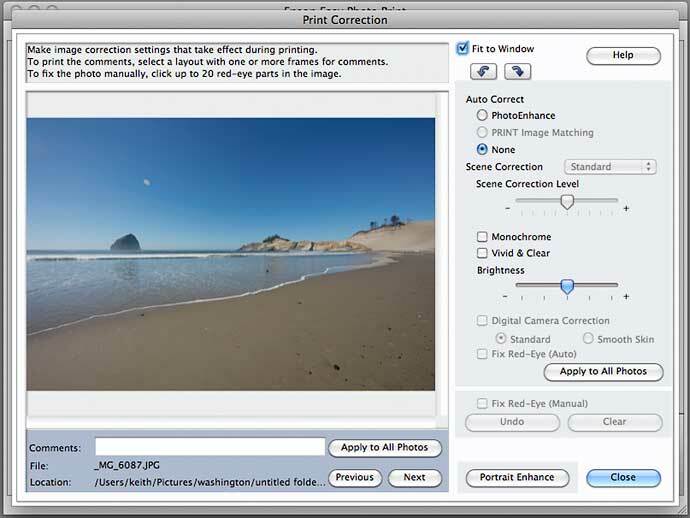 Very simple image correction, but great if other members of your family are not quite so into Lightroom as you are. Some samples quickly added onto a sheet. Don’t expect prints much different from the original images. Personally, I’d use this for index prints but not a lot more. Take care with text and font choices, since many of the captions were truncated and missed a few letters. The CD loading is initiated from the front panel. As with other instructions via the front panel, the diagrams are clear and comprehensive. 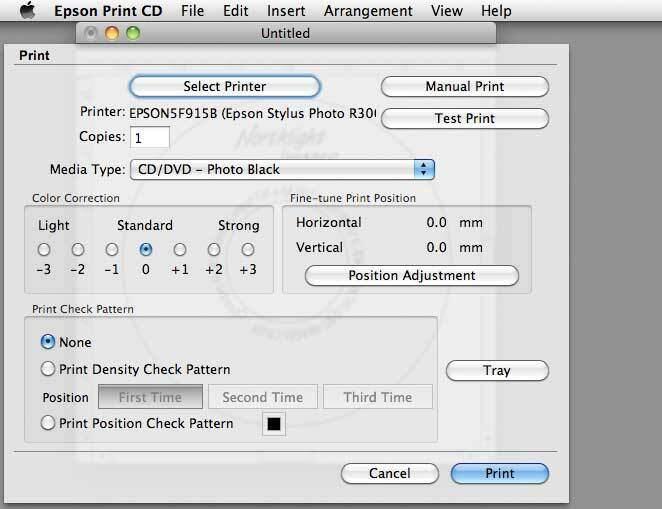 There is CD printing software supplied (Epson Print CD) which is simple to use and offers much of the labelling functionality most people would want. You can add background images and text effects. There are also templates for sleeve design and layout. 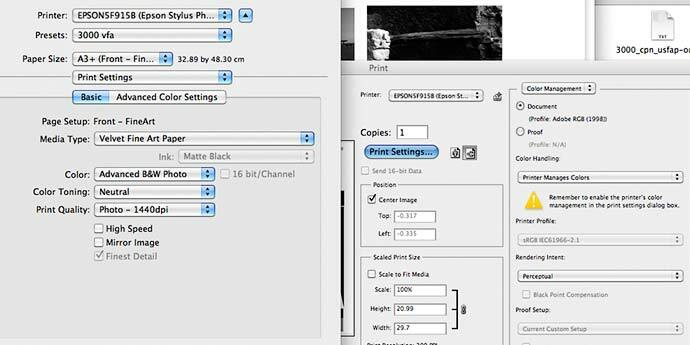 The print software provides quite a lot of adjustment options for print quality optimisation, including test prints on plain paper. The printed CD is ejected after printing. The CD tray is easy to load and unload, but you wouldn’t want to stand around and do too many at one time. Printers are getting better all the time. It’s getting increasingly difficult to separate them on print quality alone. 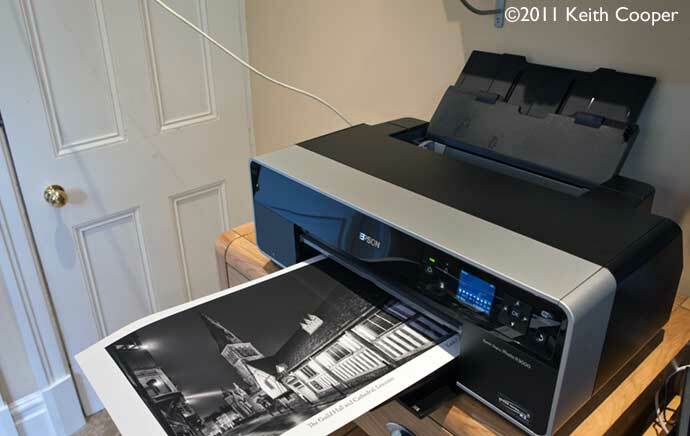 The R3000 produces prints of the same level of quality of the SP3880 – prints I’m happy to use to show my work, both in colour and with the dedicated ABW black and white print mode. Colour gamut is not quite up to some of the big 12 colour printers, but they cost a lot more, and to be honest, images that really show the difference are few and far between. I was particularly impressed with the quality of the ABW mode on a variety of fine-art and lustre finish papers. 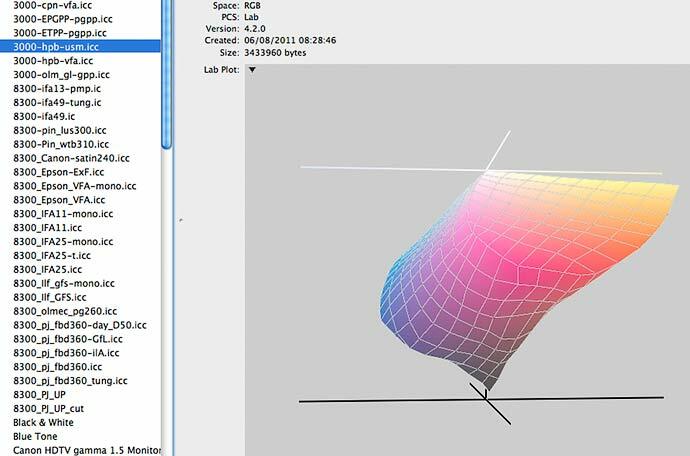 All were linear enough to show minimal benefit from creating customised QTR linearisation curves. 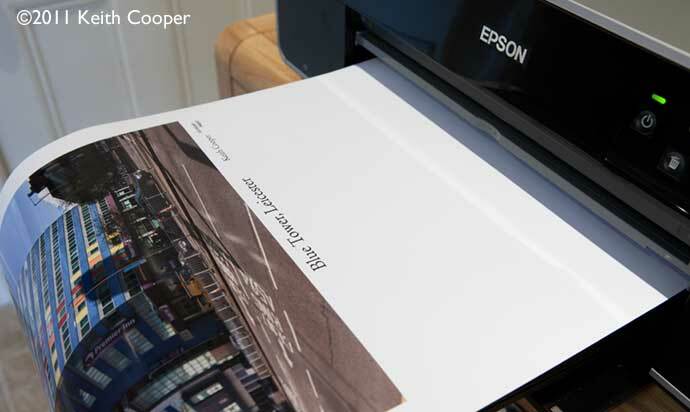 Although I always make custom profiles when testing printers, I noted that for Epson branded papers, the supplied profiles were very good for most images. Paper handling feels more solid than the R2880, particularly with heavier papers via the front load slot. During all of our testing, there was not one paper misfeed. Even the CD and ‘Easy print’ software have come along a lot in terms of usability and functionality, with the CD printing capable of quite detailed adjustment. 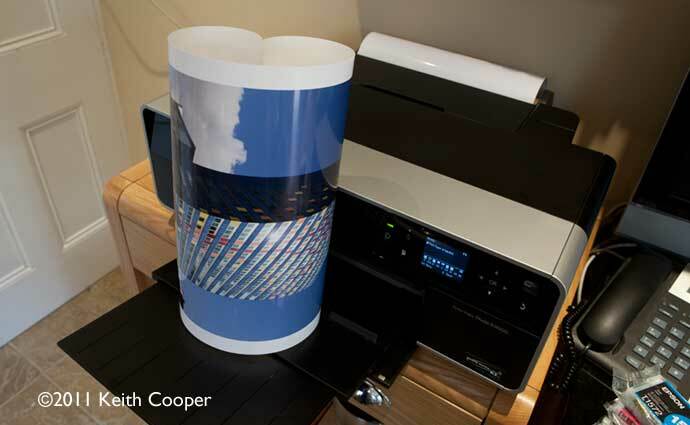 The printer is slightly faster than the R2880 – I printed four copies of an image. It took just under twelve minutes to print the A3+ prints below. I could see no difference in print quality between bidirectional and unidirectional mode, and even with a very high resolution image, the only real difference with the very highest quality setting, was it took longer. Actually, with a powerful magnifying glass, I thought I could just see an improvement to the image, but the next morning I wasn’t so sure – partly because I’d not labelled which was which. The inks show very little gloss differential and no bronzing was visible on any of the papers I tested. To show the effect below I had to take care with the camera angle and lighting – if this aspect of gloss papers is a problem, then go buy yourself a printer with dye based inks, or a clear gloss over-coating. There has been a lot of discussion over the relative costs of the 11.4ml cartridges for the R2880 and the 25.9ml cartridges of the R3000. These frequently neglect to take into account the amount of ink left in two (and a bit) R2880 carts used for every R3000 cart. There is also the smaller 2pL droplet size of the R3000 and the smaller amounts of ink used to switch blacks (Epson don’t provide info for this in theR2880 specs – I’m basing this on reports from users, so usual warnings). We make a specific point of not selling hardware, but if you found the review of help please consider buying the R3000, or any other items at all, via our link with Amazon. Although I can’t give any detailed figures, overall ink usage seemed broadly similar to the R2880. 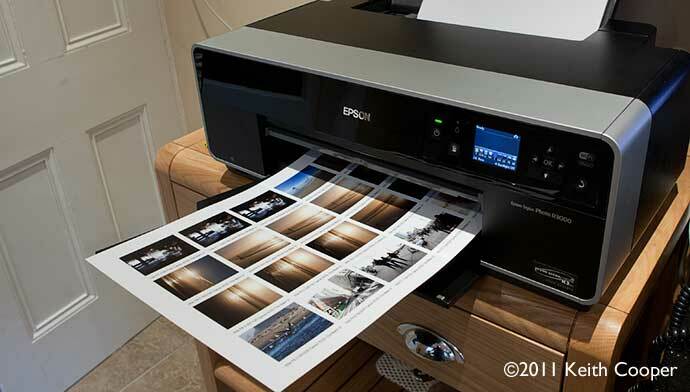 At Epson’s current (UK) advertised ink price, a photo black to matte black to photo black cycle would cost you just under £4 (20% VAT included). So, ink costs may save you a little bit, but this printer feels quite a step up from the R2880 – I felt it much more akin to the 3880 [SP3880 review], but just a bit smaller. If you’ve got an old 2100/2400 and are looking for a distinct improvement in your printing, then the R3000 is well worth a look. The R2880 is still available since the R3000 is an all new model not a replacement. If I didn’t need 13″ roll paper, then I’d personally still go for the SP3880 with its bigger carts and more economic operation (average print costs for the SP3880 are around 60% of the R3000). 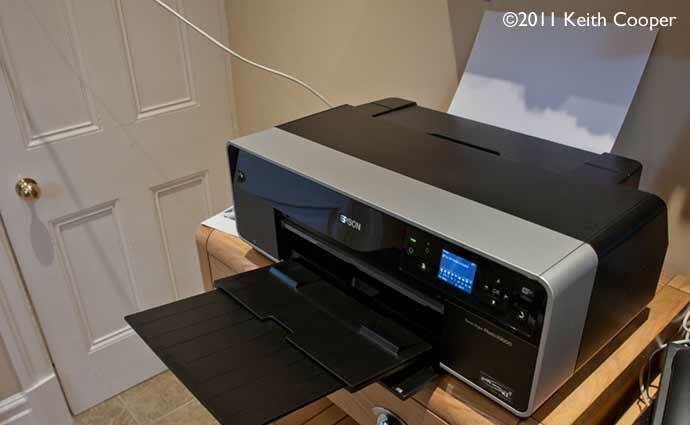 Whereas with the R2880 and SP3880 this was an easy choice, between the R3000 and SP3880 it’s a closer run thing, where you really do need to look at how much printing you are going to be doing and of what. 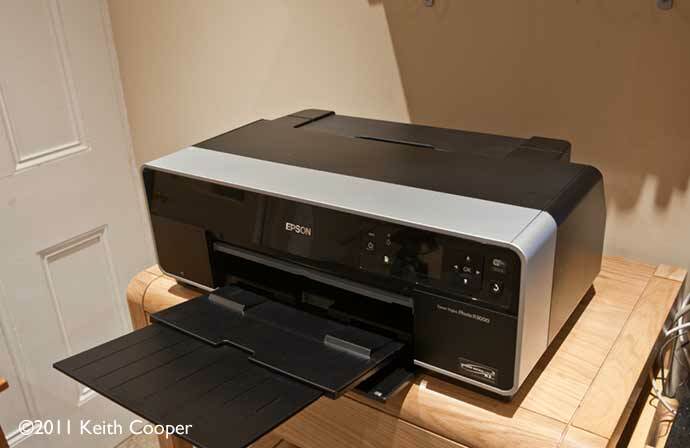 The printer is quieter than the older A3+ models. It also looks better sitting on my desk. The colour LCD screen is well utilised and clear to read. Print quality is consistently good and the need to swap black in cartridges is no more. I’d still prefer both blacks to be available without the loss of ink in switchover, but if you don’t swap between papers as much as I do, then this might not be an issue. Whilst print quality might not be much different from the already good R2880, the rest of the printers features do move the R3000 into a new league. 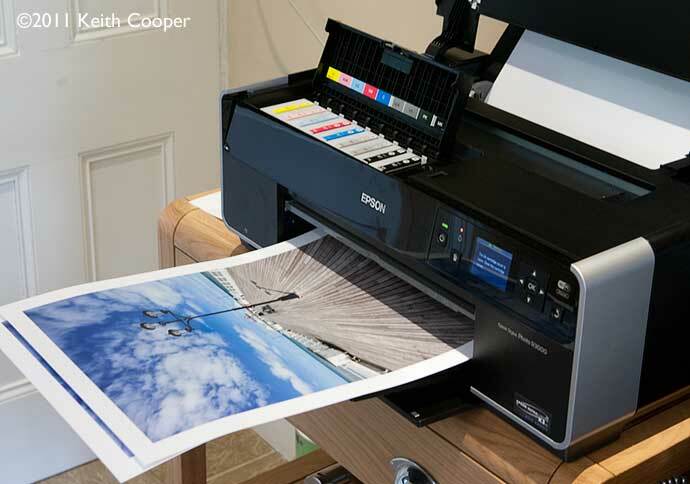 A pigment ink based A3+ printer that produces excellent black and white and colour prints. Supports a range of media, including thick paper (to 1.3mm), roll paper and printable CDs. Operating Systems: Mac OS 10.3 – 10.7, Windows 2000/XP/XP x64/Vista/Win7. 1 Colour photo speed in Superfine Mode on premium Photo Paper Glossy measured from start of paper feed. Actual print time will vary based on system configuration, software application and page complexity. 2 Ink used in conversion varies based on temperature, humidity and other factors. 3 Cartridge yields vary considerably for reasons including images printed, print settings, temperature and humidity. Yields may be lower when printing infrequently or predominantly with one ink colour. A variable amount of ink remains in the cartridge after the “replace cartridge” signal. 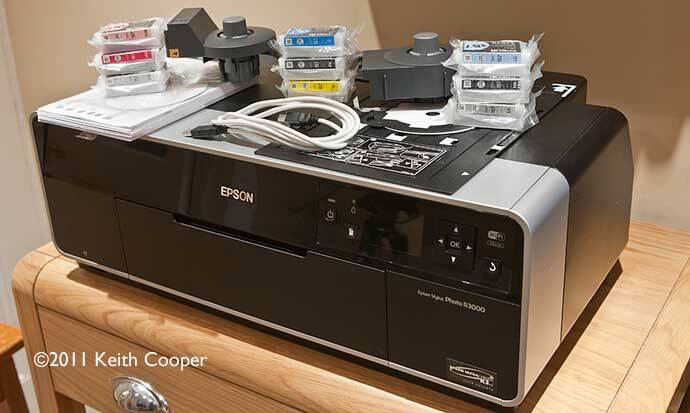 Part of the ink from the first cartridges is used for priming the printer. 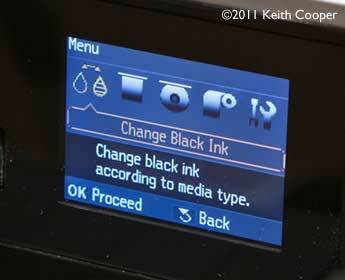 Ink is used for both printing and print head maintenance. All inks are used for both black and colour printing.